This pulse generator module is intended to be interfaced with common types of stepper / motor controllers. The module has two modes of operation, frequency and PWM. In frequency mode it will generate a square wave signal at a frequency that can be controlled by the user via a large potentiometer dial. In this mode there are 3 frequency ranges which can be selected by a jumper (see below). In PWM mode the module will generate a pulse width modulated signal with a duty cycle set by the potentiometer. There are also two latching switches that allow a user to enable/disable the motor output, and a motor direction control. The module also has two power input ranges allowing it to be powered from a very broad power supply range. Please note: This module is intended to be used in conjunction with a motor driver, it cannot be used for driving a stepper motor directly. When using the 12V to 160V supply input option,the 5V to 12V terminal must be left disconnected. Com Anode..............Output for motor drivers with opto-isolated common anode inputs. Com Cathode/GND.....Output for motor drivers with opto-isolated common cathode inputs. ENA........................Connects to motor driver enable input. DIR........................Connects to motor driver direction input. PUL........................Connects to motor driver clock/step input. 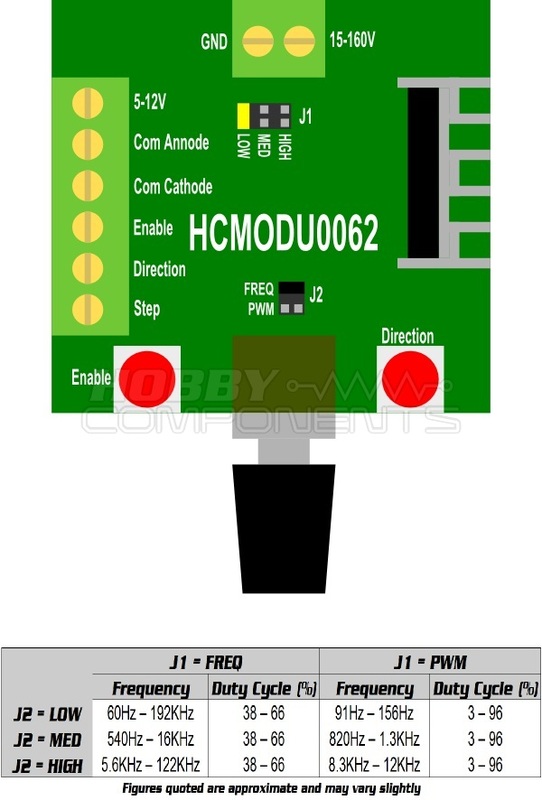 Hi, I wired the boards exactly as shown above in the diagram, and after working for a few seconds, the hcmodu0062 went absolutely dead short 0.3ohms. see if it works. By the way, I think the original zener was 12v. It went short with 12.2volts from my lab psu. So do not allow the direct input voltage to go anywhere above 12v. Better still use the regulated input. I got to replace the zener diode today, and it is now functioning as it should. Its an easy way to test stepper motors and drivers.